We get asked a lot of questions when we do one of our Free Podcast Day events, or when we speak at seminars and conferences, and we’ve decided to take those and turn them into posts here on the site to hopefully help answer some questions that you might have about getting started, or what your next steps might be / could be / can be / should be. Rather than telling you who we are, it’s much easier to tell me who we aren’t. We are not “experts”. We’ve simply screwed up just about every way one can possibly screw this stuff up… but we’re also not afraid to share our missteps and mistakes to keep you from making them yourself. We are not trying to sell you anything… not even using our studios or services. We’re very up front about that… you don’t need us to do this. At all. 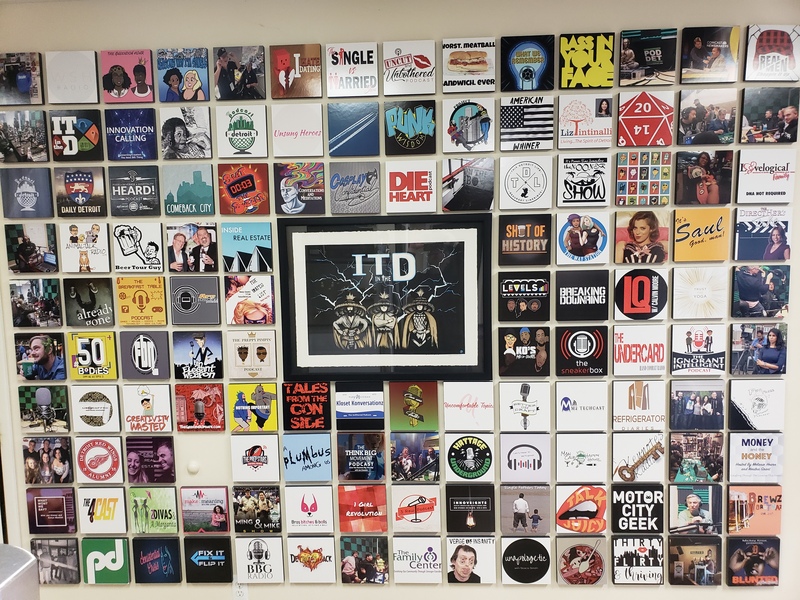 While we’d love to see your logo join our wall of shows, one of the greatest things about podcasting is that the barrier to entry is amazingly low. So that’s who we aren’t. But who are we? Why should you even be reading this? We’re the kind of people who believe that information and experiences should be shared so that others can learn… and so that we can as well. We’ve taken what was our “bowling night” podcast experience and managed to turn that into first one, then three, and now six studios in three different buildings. Over the years, we’ve built out 9 studios with varying capabilities and technologies. We have audio studios with video available, and a dedicated video studio. We are people who have gotten insanely lucky in having had the opportunity develop to build a platform that currently hosts more than 100 shows. Along the way, we’ve managed to build a revenue stream from our own podcast, and helped several others do the same. So, in summary – we’re not here claiming that we have all of the answers, or that we know everything that there is to know about the world of podcasting… but we’re willing to share our knowledge, our pain points, our observations, and our experiences from over the past six years with you to hopefully help you either get started, get better, or at least just avoid some of the stumbling blocks we found ourselves hitting over the years. And our inbox is always open for questions, comments, additions, etc. Drop us a note at contact@podcastdetroit.com any time.